Everyone knows that selling body organs like kidney, among others is a serious crime in the US. Organ donors experience severe health problems that can sometimes prove very expensive or even fatal. At the same time, there is several other stuff from your body that you can legally sell in America. Most of these are harmless meaning there is no bad impact on your health. And it earns you a lot of extra money. Some of these ideas to make money with your body may sound yucky and revolting. But thousands of Americans are indeed making lots of money in a legit way using these ways. Yes, your body is indeed like a treasure trove. It has hidden treasures that can be sold without causing you any harm if you are careful. Understandably, it is not easy to make fast money with your body. But once you get into the trade, you might start making money fairly quickly. Here we look at what stuff from your body can be sold to make quick money. Federal laws outlaw selling body organs, as we mention earlier. Yet, they do permit healthy individuals to sell body fluids and secretions to clinics, hospitals and companies. 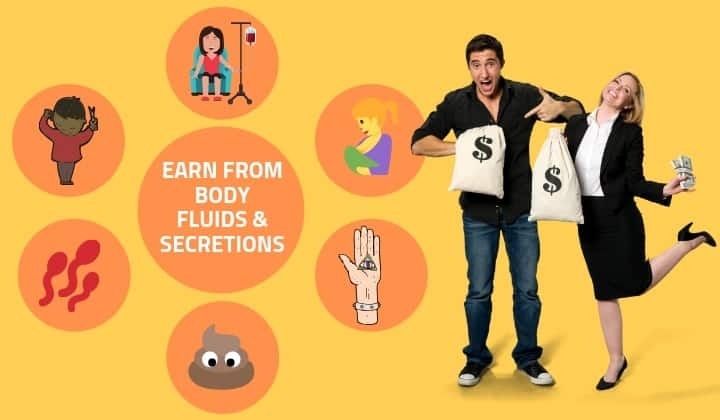 Here we look at 8 different types of body fluids and secretions that you can sell and make quick money. Not every woman that delivers a baby is fortunate to lactate. This means a newborn child will have to be fed on artificial formulas that contain almost every ingredient found in a mother’s milk. Unfortunately, modern medical science and advances are unable to precisely imitate nature’s process of making breast milk. As a result, there are several companies and organizations where a woman can sell breast milk. Who buys it? Parents of newborn babies of course. You can opt to donate breast milk or sell it for some money. There are various websites where you can sell breast milk. And there are companies that operate breast milk banks that will pay you for this essential food for a baby. As a lactating woman with surplus breast milk, you can make considerable money. Breast milk fetches a minimum of $ 1 per ounce. The money you make depends on demand and supply. Now, who would want to buy your poop? Not organic fertilizer companies since they have plenty of animal poop than they can handle. This may surprise or amaze you, but there are companies in the US that actually buy your poop for medical uses if it meets their standards. They use your poop for a medical procedure called Faecal Microbiota Transplantation or FMT. In simple words, it means they transplant your healthy poop into the colon of patients suffering from recurring infections caused by a bacteria called C. difficile. This bacterial infection occurs when other microbes in the patient’s excretory system cannot fight C. difficile. When your healthy poop is transplanted, it helps the patient’s colon to develop other bacteria that can fight C. difficile infections and get cured. Unconfirmed reports suggest you can make as much as $ 10,000 per year by selling poop. Since FMT is a medical procedure approved by America’s health authorities, selling your poop is legit. Another bizarre stuff from your body that sells is pubic hair. The reason: A lot of women are unable to grow natural pubic hair due to frequent waxing and other procedures. It can make them appear unattractive to male partners. There are specialized hair transplant centres that provide pubic hair restoration for such women. Sometimes, it is also used for growing hair on chest and hands, especially for men who appear effeminate. How much money you can make? This depends upon who wants to buy your pubic hair. It would involve you to undergo a medical procedure to collect your pubic hair for transplants. And of course, it is legit. Donating plasma is a fully legit way of making money quickly from your body. On average, a regular plasma donor makes between $ 20 and $ 50 per week. Under current Federal laws, a healthy donor that meets all specifications can donate plasma twice a week. This translates as anything from $ 80 to $ 200 per month as extra money from your body. There are hundreds of plasma collection centres in the US. You can select one nearest to your place. Before accepting you as a plasma donor, the company will screen you for medical problems and general health. These plasma collection companies will credit money directly to your debit card or PayPal account. You should have excellent health if you intend to sell plasma. American laws for plasma collection companies and donors are very stringent. They are meant for your protection. Never violate a plasma donation rule because it can cause major health problems. A placenta is a body fluid found in pregnant women. Medical science proves women that consume their placenta after delivery enjoy better health and lactation. However, the placenta has found newer uses too such as used in beauty products and for making arts. If you are pregnant, join an organization where you can learn how to use this vital fluid for making money quickly from your body. The placenta can be encapsulated to make nutritional supplements too. You can easily find a placenta encapsulation centre in the US or any other country. Or you can become a certified placenta artist and create various collectables that are unique and fetch a high price. Thick, lush hair is known as the crown of your beauty. Additionally, hair is also something you can use for making quick money from your body. Understandably, selling hair is not for everyone. You need to meet strict standards and specifications. Who needs your hair? Companies that make wigs, false bears and also clinics that provide hair transplants. Considering you have excellent hair, it is possible to make as much as $ 500 for every cut. Register as a seller on a good website that buys and sells hair. You will have to undergo a medical check and tests for hair quality before you qualify as a seller. Finding customers may take some time but the amount of money you can make every year is worth the wait. Federal laws prohibit selling body organs. And your skin is no exception. Just in case you did not know, skin is the single largest organ of the human body and hence comes under the Federal ban. However, making quick money from your body is now possible without as much as donating your skin. Small and large businesses will pay you for advertising their products on your body. This is done by placing temporary tattoos on parts of your body that will be prominently seen by others. This is an unconventional form of advertising but there are instances where people have made big money by carrying temporary tattoos to advertise a product or service on their skin. Healthy and virile men between 19 and 38 years age can donate sperms to earn up to $ 1,000 per month. This sounds very exciting since your sperm will be used to impregnate women you have never seen. The child will carry your genes and possibly bear some of your features. But sperm donation is not for everyone and anyone. American sperm banks enforce stringent rules on who can be a donor. You need to meet their specifications regarding genetics, education, residency status in the US, employment and several other factors before you are even considered as a donor. Being a sperm donor does not mean you will father several children. In fact, you may have to donate sperms frequently just for a single client of a sperm bank. The process is not enjoyable as shown in movies. It can be painful. Sperm donors are also known to suffer from psychological problems because they remain in the dark about their unknown and unseen child. Making quick money from your body is easy provided you are willing to take some pains. In fact, a lot of Americans that live below the poverty line or struggle with finances sell their plasma or other bodily stuff to make ends meet. Selling blood is strictly prohibited in the US. There are some medical labs that may buy female urine occasionally for strictly medical purposes like making microbial cultures to find cures for various infections. Use these methods for making quick money from your body only if you are in a desperate situation and cannot find any other means.